Update: A full specs list for the Samsung Galaxy S10 has leaked complete with a few surprises. Plus, Samsung has seemingly confirmed the names of its upcoming phones, and a leaked video shows off some official cases. 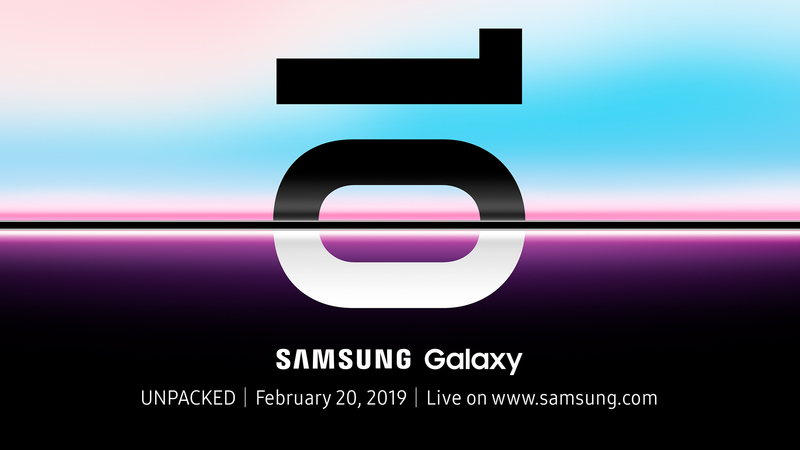 We&apos;re closing in on the Samsung Galaxy S10 release date, with the official Unpacked launch event happening this month in San Francisco, where we&apos;ll be reporting on it live. You don&apos;t have to wait until the Samsung Galaxy S10 launch date of February 20, however. New Galaxy S10 leaks are spilling out almost daily now, and have potentially given us an early look at what we suspect Samsung&apos;s smartphone for 2019 might look like. The Samsung Galaxy S10 is shaping up to be a more significant upgrade compared to last year&apos;s relatively incremental spec bump from the Galaxy S8 to the Galaxy S9. It&apos;s enough of a tempt all of those holdouts who are waiting for the next big thing in order to upgrade their Samsung phone. 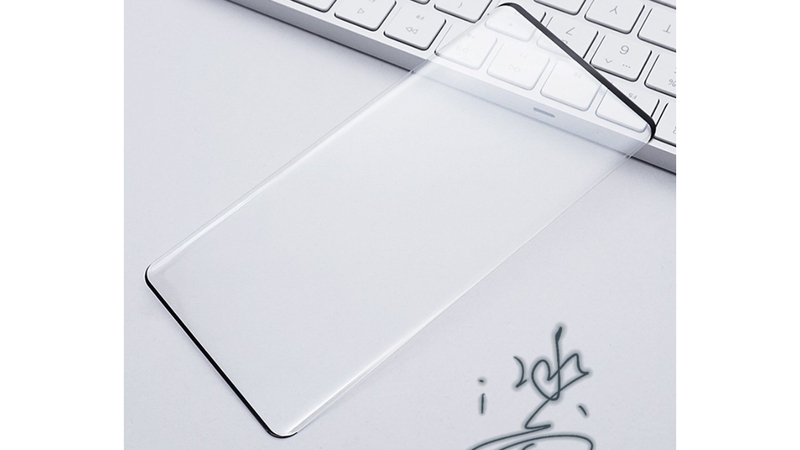 It&apos;s rumored to have a fresh-looking all-screen display with less bezel at the top. Not only that, it may have &apos;hole punch&apos; front-facing camera embedded in the screen&apos;s top right corner. We may also see Samsung adopt an in-screen fingerprint sensor and be the first to launch a phone with the Snapdragon 855 chipset (in the US variant, at least). Of course, you may have a few more choices this time around. The Samsung Galaxy S10 is likely to be joined by the Samsung Galaxy S10 Plus and even the Galaxy S10e, a &apos;lite&apos; version of the new smartphone meant to take on the iPhone XR. Seems like a lot all at once? We&apos;re a month out there will be even more leaks to pour over. After all, the Galaxy S10 is Samsung&apos;s 10th anniversary Android phone. It has been teasing a few surprises for us in February. Here&apos;s what we know to date. The Samsung Galaxy S10 launch date is confirmed as Wednesday, February 20, meaning we&apos;ll see the smartphone days before MWC 2019, which takes place from February 25-28. We&apos;ve heard that date rumored before, so it doesn&apos;t come as a complete surprise, though some other rumors put forward different dates. Of course, that&apos;s just when the S10 will be announced – it might not go on sale for another week or two. The main rumor there points to a March 8 sale date in South Korea. We&apos;ve also now heard that it could land in Italy that day, while another source also talks of a March 8 street date, so this sounds like a global launch date. That&apos;s for the three main models (the S10, S10 Lite and S10 Plus). However the source adds that the 5G S10 – which might be called the Galaxy S10 X – will land in stores on March 29. Whenever the S10 range lands, it&apos;s likely to be sold by EE in the UK, as the network already lets you register for updates on it. That said, we&apos;d expect just about all networks to offer one or more models of the S10. When the Samsung Galaxy S10 does go on sale it&apos;s sure to cost a lot. One price rumor puts the budget Galaxy S10 Lite model at $650-$750 (roughly £500-£585 / AU$900-AU$1,040), while another rumor has the Samsung Galaxy S10 price rise to £799, which will likely be around $779 (around AU$1,400) for the 128GB variant and £999 for 512GB of storage. Another source points to a price of €929 (around $1,055 / £820 / AU$1,475) for a standard S10 with 6GB of RAM and 128GB of storage, rising to €1,179 (around $1,340 / £1,040 / AU$1,875) for a version with 8GB of RAM and 512GB of storage. More recently, an extensive price leak for all three rumored S10 handsets has the standard Samsung S10 starting at €899 for the 6GB/128GB configuration and rising to €1,149 for the 8GB/512GB model. Elsewhere, we&apos;ve heard that the cheapest model (aka the Galaxy S10 Lite or Galaxy S10e) will cost between around 800,000 won (roughly $710, £550, AU$990) and 900,000 won (around $800, £620, AU$1,110). The same source claims that the top-end 5G model will cost between 1.6 million won (around $1,430, £1,110, AU$1,980) and 1.8 million won (roughly $1,600, £1,250, AU$2,230), making it around twice as expensive. In short though, the Samsung Galaxy S10 price is all but guaranteed to rise over the asking price of the Galaxy S9 – so you might want to start saving. 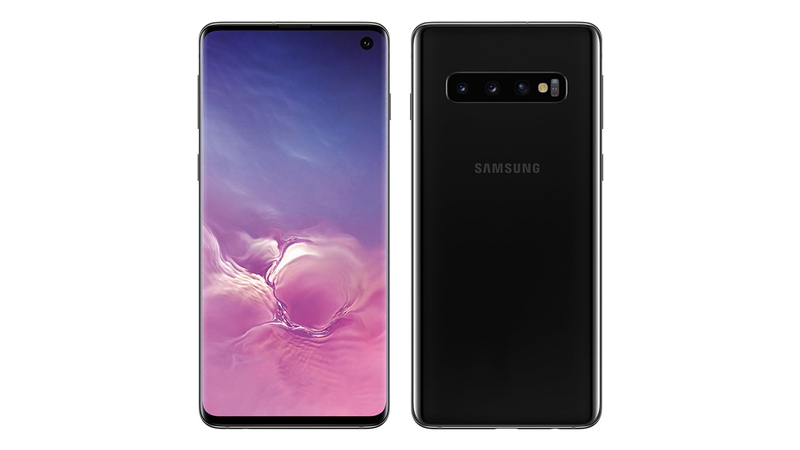 There&apos;s the standard Samsung Galaxy S10 that&apos;s detailed here, along with the Samsung Galaxy S10 Plus and a new entry in the Galaxy S10e – a smaller, low resolution and likely lesser powered handsets at a hopefully more affordable price point. Our best look yet at the likely design of the Galaxy S10 comes from a series of photos showing it alongside the Galaxy S10 Plus. 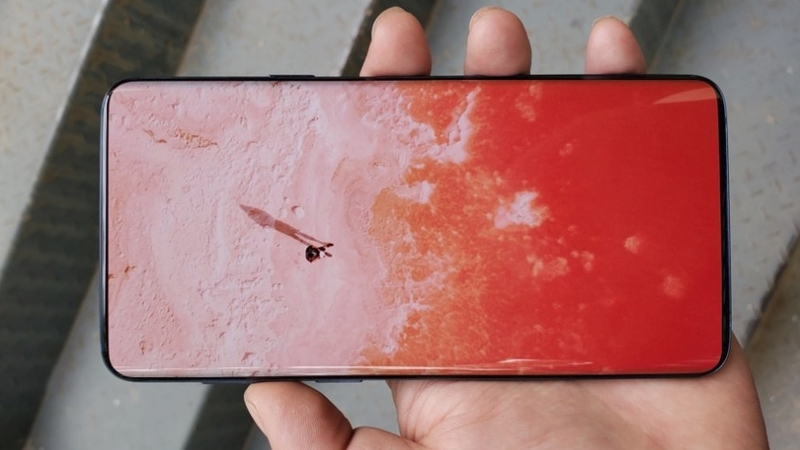 These followed hot on the heels of other images, shared on Twitter, which showed a matching design and also revealed the S10&apos;s built-in cryptocurrency support. Before all this, the first alleged Samsung Galaxy photo arrived as we rang in 2019, and it once again matches up, showing a more expansive all-screen display, one that displaces the top bezel in favor of a tiny front-facing camera embedded into the top right side of the screen. This is Samsung&apos;s answer to the notch cut out, and you can expect the company to come up with a clever name for this black hole that disrupts its Infinity Display. More recent leaks, which you can see below, show off the S10 in a pearly white shade, as well as both the S10 and S10 Plus in black. 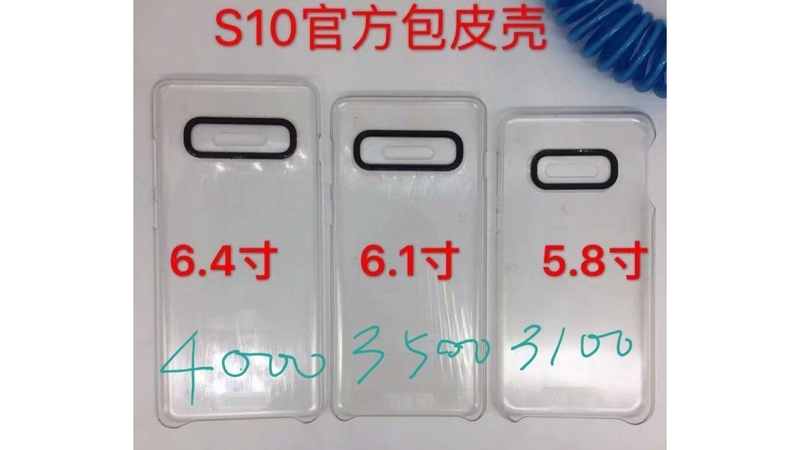 Evan Blass also leaked the image you can see below, showing three Galaxy S10 phones – the S10E, the S10 and the S10 Plus – inside clear cases. You can see a dual-lens rear camera on the cheaper S10E, and a triple-lens rear camera on the S10 and S10 Plus phones. It also looks like the S10 Plus has a dual-lens front-facing camera – note the wider pinhole cut out in the display – and it looks like all three phones will have fingerprint sensors built into the screen. We&apos;ve also now seen a render from Samsung itself that possibly shows the phone. You can see this below and note the curved screen, tiny bezels and pinhole camera. You can also see it alongside the Samsung Galaxy S10 Lite (which sports a similar design) and the S10 Plus, which adds extra cameras. We&apos;ve also had a closer look at the Samsung Galaxy S10 Plus, thanks to some leaked renders which you can see below. The renders, which come from a fairly reliable source (@OnLeaks) show a handset with an angular Galaxy Note-like design, but more importantly it has a camera cutout in the screen. This is a new idea for Samsung and it&apos;s a bigger cut-out than you might have expected, as it&apos;s housing two cameras. However, the bezels around the screen are tiny at least. The back of the Galaxy S10 Plus shown here has a quad-lens camera arranged horizontally and is shown in both black and &apos;Ice Blue&apos;. Note that originally renders showing a triple-lens camera and larger bezels were leaked, but these were apparently inaccurate. Other details in the images include a 3.5mm headphone port and it looks like the phone has a glass back and a metal frame. Dimensions meanwhile are apparently 157.5 x 75.0 x 7.8mm, rising to 9mm at the camera bump. We may also have now seen photos of the Samsung Galaxy S10 Plus, which you can see below. Two leaked images both show a handset with two rear cameras, but the color of the camera block and possibly the size of the lenses differs. That might mean only one of these shots is accurate, or we could be looking at the standard Samsung Galaxy S10 in one and the Galaxy S10 Plus in the other. In any case, cameras aside the back is likely to be similar on both handsets and indeed it looks similar in these shots, with slightly curved edges and a likely glass build. Another image (also below) shows the possible front of the S10 Plus, complete with a corner notch. We&apos;d take all of this with a pinch of salt and as this is probably the Plus model it might not be entirely representative of the standard S10, but they&apos;re likely to look similar, and according to Samsung&apos;s own mobile business chief, DJ Koh, the Samsung Galaxy S10 will have some "very significant" design changes and come in some "amazing" colors. One leak from OnLeaks suggests those colors may be Black, Grey, Blue, Red, Green and Yellow, while in announcing some software Samsung may have hinted that the phone will come in silver, green, black, blue and pink shades and will have a 3.5mm headphone port. Another source meanwhile says the standard S10 and S10 Plus will come in white, black, green and blue, while the Galaxy S10 Lite will additionally come in yellow, as you can see below (along with an image of it in white and blue). We&apos;ve heard that claim more than once now, along with a suggestion that it might have a glossy finish. We&apos;ve also heard that the whole S10 range will come in black, white and sea green, but that some models will be offered in additional shades. An extensive Galaxy S10 leak seems to agree with all the color rumors above, listing everything from black, white, green and blue to canary yellow, prism black, pearl white, ceramic black and ceramic white. It appears, then, you&apos;ll have a fair selection of options come launch. We&apos;ve seen pictures shared by Evan Blass that show the pinhole notch in the center of the screen. You can see the three sizes of display on show for the S10 Lite, the S10, and the S10 Plus too. However, the camera position here is at odds with most leaks. 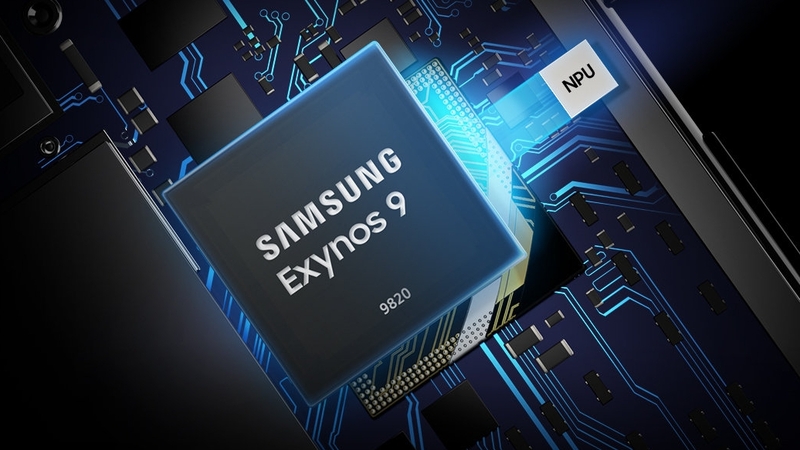 Meanwhile, a benchmark for a mystery Samsung phone which could be the S10 points to a 19:9 aspect ratio, which would make it taller than the 18.5:9 Galaxy S9 – benchmarks for the Galaxy S10 Lite and Galaxy S10 Plus have also surfaced suggesting the 19:9 aspect ratio. One thing the Galaxy S10 might not have though, is a notch, because, as noted by T3, Samsung has taken to Twitter to criticize the notch on the Google Pixel 3 XL, so presumably it won&apos;t be going down that route for its next flagship. Having said that, the company has now revealed several new screens, some of which do have notches. 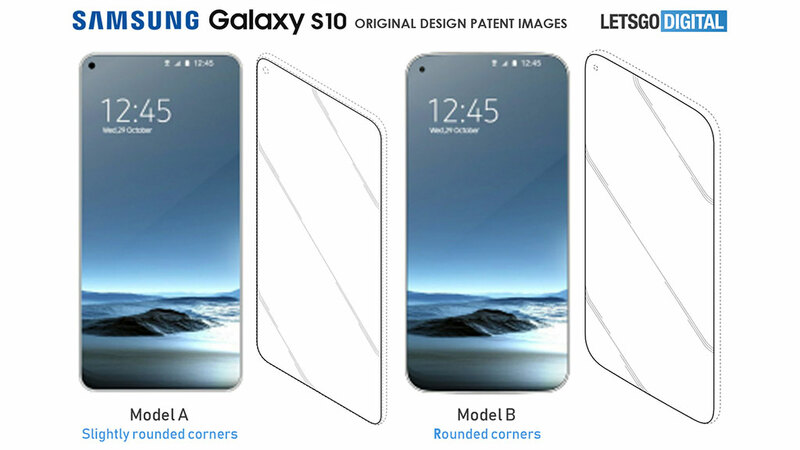 And a source claims that the most basic S10 model will have a flat &apos;Infinity-O&apos; display, which is one of these new screens and has a circular cut-out towards the left edge of the display, rather than a conventional notch. This would be a bit like the hole pictured in the renders above. We&apos;ve heard similar from another reliable source, saying that at least one model (though in this case it sounds like a higher-end one) will have a "punch hole" style selfie camera cut-out. The image below gives another idea of how that might look. This is from a patent filed by Samsung, though it doesn&apos;t have the Galaxy S10 name attached. A pinhole camera of some kind is looking very likely, especially now that Samsung has announced the Galaxy A8S with just such a camera. Though if you&apos;re put off by the size of the camera on that phone, don&apos;t be – another leak suggests the S10&apos;s will be smaller. It&apos;s possible – if very unlikely – that Samsung will go further though and launch a phone with no bezels, notch or pinhole camera. Indeed, a leaked screen protector apparently for the Samsung Galaxy S10 shows a design with virtually no bezels, no notch and seemingly no camera cut-out. You can see that below. Since then, the same source has shared another image showing either the same screen protector or a very similar one, as you can see below. Once again, there&apos;s no obvious camera cut-out, no notch and basically no bezels. 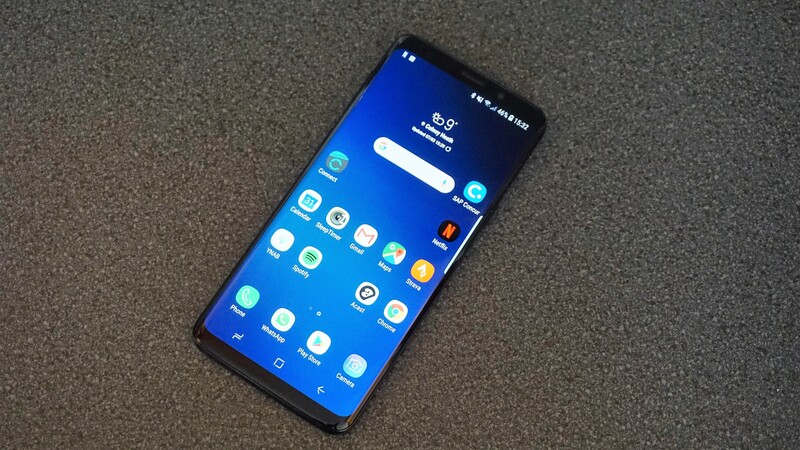 We&apos;ve also seen a photo, possibly showing a prototype of the Samsung Galaxy S10 (though notably the source didn&apos;t refer to it by name but did say "this may be a design beyond", and &apos;Beyond&apos; is believed to be the codename of the Galaxy S10). The image, which you can see below, shows a handset with a curved screen and almost no bezel on any edge. There seems to be less bezel in fact than we&apos;ve seen on any other phone, suggesting the front-facing camera may either pop up or be built into the screen. 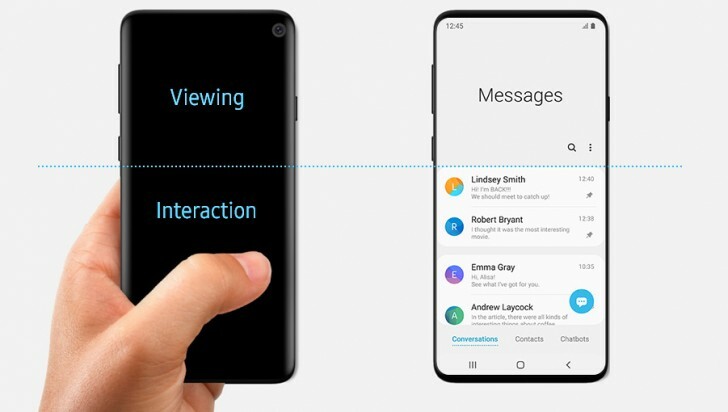 You can&apos;t see much else, but in addition to the power and volume buttons it looks like the Bixby button is making a return – if this photo really is showing the S10 and if nothing changes in the design before launch, which are two big ifs, especially as reputable leaker @OnLeaks has poured cold water on the image, claiming it&apos;s fake. When it comes to the screen though it’s worth noting that there’s sure to be more than one size. In fact, this time around there might be three or even four. One of these, apparently codenamed &apos;Beyond 0&apos;, is said to have a 5.8-inch screen which might be flat. That would be the most basic model, but there&apos;s also said to be &apos;Beyond 1&apos;, which apparently has a 5.8-inch curved screen, and &apos;Beyond 2&apos;, with a 6.2-inch curved screen. There’s also said to be differences in the three models’ fingerprint scanners and cameras, which we’ll get to in the relevant sections below. All of that has been given more credence thanks to people familiar with the matter speaking to Bloomberg. Those sources also confirmed the company is experimenting with a prototype that loses the 3.5mm headphone jack. However, another source has slightly disagreed on the screen sizes, saying that while the basic &apos;Lite&apos; model will have a 5.8-inch one, the standard S10 will be 6.1 inches and the S10 Plus will be 6.4. Those sizes have been touted again, with Ice Universe claiming the Samsung Galaxy S10 display will measure 6.11 inches (while the S10 Lite will be 5.75 inches and the S10 Plus will be 6.44 inches). We&apos;ve additionally heard talk of a possible fourth Galaxy S10 model, which according to reports could have a 6.7-inch screen, along with six cameras total (with the extra rear lens being a Time of Flight one used for judging distances), and support for 5G. One report adds that this model might only land in the US and South Korea. We&apos;ve heard more about this handset too, with the exact screen size for the Galaxy S10 5G variant said to be a whopping 6.66 inches. In exciting but unlikely news, there&apos;s also a Samsung patent that details a second display on top of the front-facing camera, which could be used to show basic icons and animations and make for a truly all-screen front. We wouldn&apos;t count on seeing this on the S10 though. Samsung could launch a foldable variant to the Galaxy S10, however, and the long-rumored Samsung Galaxy X is rumored to launch in 2019. Reliable leaker Evan Blass has also spoken of an ultrasonic scanner, and multiple separate sources who spoke to The Bell have said as much too, adding that Samsung will also look to ditch the iris scanning tech in the Galaxy S10 in favor of an improved 3D face scanner – much like the one found on the iPhone X. And we now have an idea of why it took so long to be ready – because reportedly Samsung is using an ultrasonic scanner, rather than an optical one, as while the latter could apparently have been implemented years ago it&apos;s said to not be as good. Another recent report has added that while the two top-end Samsung Galaxy S10 models will apparently get an ultrasonic scanner, the most basic model will get an optical one. The difference essentially being that the ultrasonic one can map a 3D picture of your print, making it more accurate than the 2D optical option. That&apos;s at odds with another rumor though, which claims that the most basic model (the one codenamed ‘Beyond 0’), will have a side-mounted fingerprint scanner instead of an in-screen one. We&apos;ve heard more than once now that the basic model won&apos;t have an in-screen scanner. The other two models (apparently codenamed ‘Beyond 1’ and ‘Beyond 2’) supposedly have in-screen scanners though. All that combined could mean a truly bezel-free look, like the one shown in some of the images above. Analyst chatter isn’t always that reliable, but it would make sense if Samsung wants to compete with the Huawei P20 Pro and the rumored triple-lens iPhone. It&apos;s also a rumor that we&apos;ve now heard again, with a source claiming that while the most basic model of the Galaxy S10 might have just a single-lens camera and the middle model might have a dual-lens one, the biggest (and most expensive) version of the Samsung Galaxy S10 would have a triple-lens camera. Other recent claims say that the S10 Lite and standard S10 will have a dual-lens camera (with a 16MP ultra-wide f/1.9 lens and a 12MP variable aperture standard lens). However, another source says that the standard Galaxy S10 will in fact be triple-lens and most recent leaks and images also show three lenses. Some of the S10 models might also have a dual-lens front-facing camera according to one report, which would give the top model five lenses overall. We have an idea of the front camera specs now too, with a leaked specs list pointing to a single-lens 10MP f/1.9 lens on the S10 (with a second lens added for the S10 Plus). That&apos;s a claim that we&apos;ve heard again, with sources in South Korea saying that the top-end S10 model will have two front-facing cameras and three rear ones (a 12MP wide-angle lens, a 16MP super wide-angle one and a 13MP telephoto one). 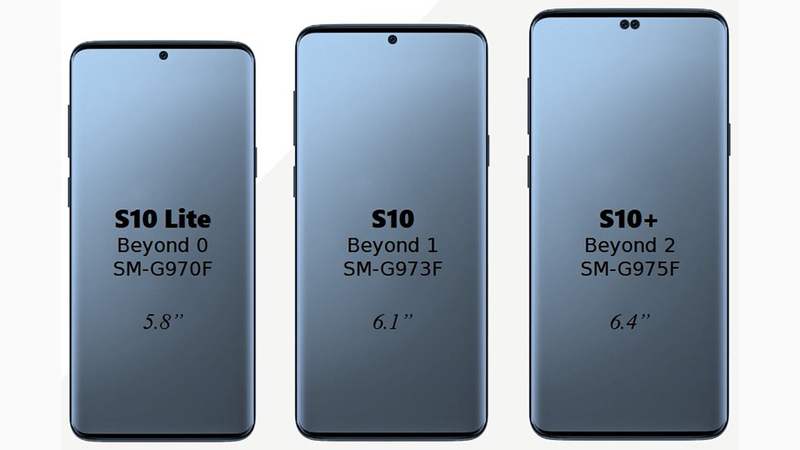 They add that the standard S10 will have two on the front and two on the back, and the basic model will have one on the front and one on the back. 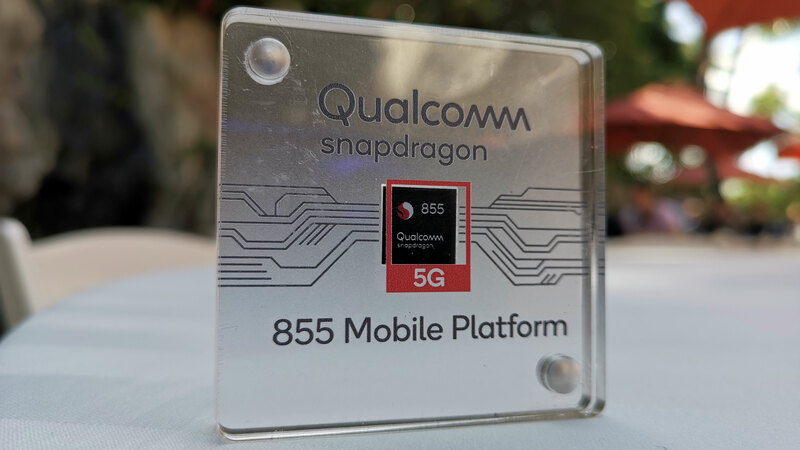 They also mention a 5G handset with six cameras, which we&apos;ve heard about before, but it&apos;s not clear whether this is an S10 model or something else. Having said that, some renders of the Galaxy S10 Plus show six lenses, so it might be accurate. 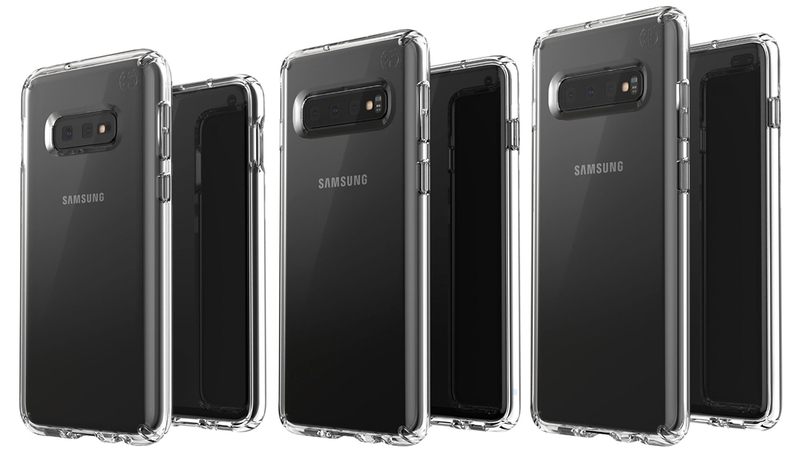 In any case, the standard Galaxy S10 is likely to have either two or three lenses, with most sources pointing to three. One battery rumor reveals possible sizes for the Samsung Galaxy S10, S10 Plus and S10 Lite. In the image below you can see cases seemingly for the three phones, and along with screen sizes that have been rumored before there are numbers that look like battery sizes. In which case, if they&apos;re accurate, the Samsung Galaxy S10 has a 3,500mAh one, the Galaxy S10 Plus has a 4,000mAh one and the Samsung Galaxy S10 Lite has a 3,100mAh one. These battery sizes have now been rumored more than once, so may well be accurate. Having said that, we&apos;ve also heard a conflicting rumor, and this comes from a certification listing, so it&apos;s more credible than most. It states that the standard Galaxy S10 will have a 3,300mAh battery and the Galaxy S10 Lite will have a 3,000mAh one, though agrees that the Galaxy S10 Plus will have a 4,000mAh one. We&apos;ve also heard from another source that the rumored 5G Samsung Galaxy S10 could have the biggest battery of all, at 5,000mAh. Not only that, but it might also support reverse wireless charging, that is, working as a charging pad for other devices. 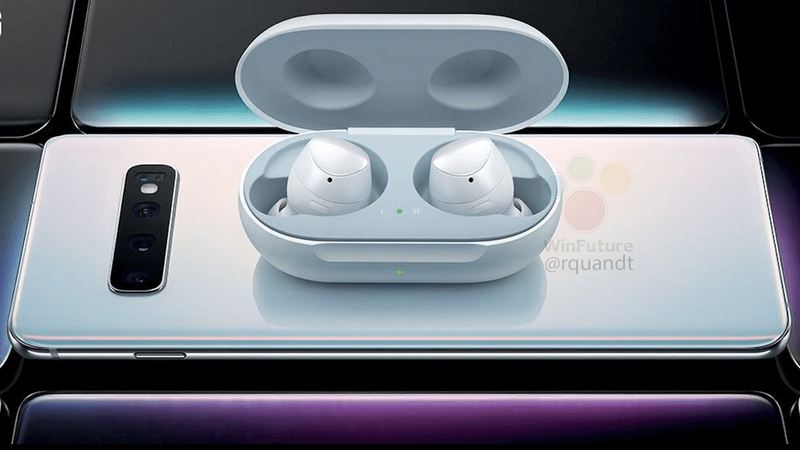 At least, that&apos;s what the leaked image below seems to suggest, showing the rumored Samsung Galaxy Buds in their charging case placed on the rear of an S10. It appears the larger S10 Plus may come in a top-spec variant with 12GB of RAM and 1TB, but it doesn&apos;t look like the Samsung S10 will get the same treatment. Even the Samsung Galaxy S10 Lite could have top specs, with a rumor pointing to the same chipset at the rest of the range. That&apos;s backed up by a benchmark seemingly showing it with a Snapdragon 855 chip and 6GB of RAM, though the scores are disappointing. However, that could just be down to the software not yet being optimized. Onboard storage could also be faster for the S10, as Samsung is set to start using UFS 3.0 storage in early 2019. This is supposedly two times faster than current phone storage modules and takes up less space, so there&apos;s more room for other components. Elsewhere, we&apos;ve heard that the standard Galaxy S10 will have 6GB of RAM and 128GB or 256GB of storage, while the Galaxy S10 Lite will have 4GB of RAM and 128GB of storage. We’ve also heard talk that Samsung might rename the range, launching the next model as the Samsung Galaxy X rather than the Galaxy S10. That might sound unlikely, but Koh Dong-jin, the head of Samsung&apos;s mobile division, has been quoted as saying that "we have been thinking about whether we need to maintain the S moniker or the numbering system" so it&apos;s possible. More recently, a leak suggests Samsung may revive the &apos;Edge&apos; moniker, which may mean this handset actually launches as the Samsung Galaxy S10 Edge. It seems unlikely though, as the &apos;Edge&apos; screen which the moniker denoted is now ubiquitous across Samsung&apos;s flagship range, so it doesn&apos;t make sense to add it to the end of the Galaxy S10 name. 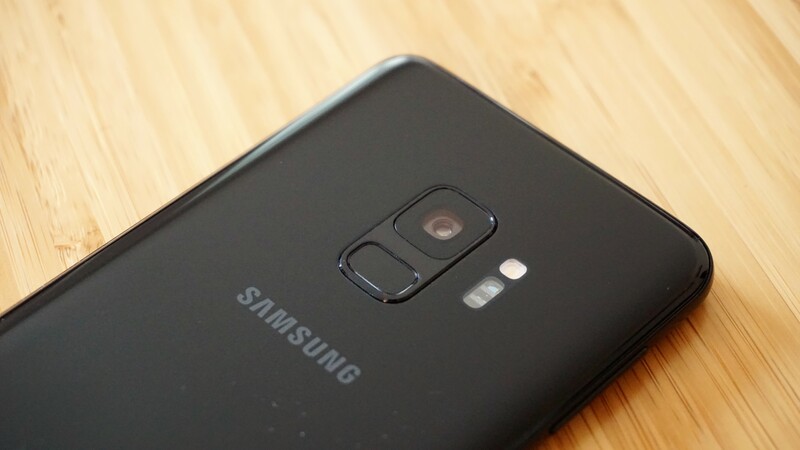 As good as the Samsung Galaxy S9 is, it’s also rather too similar to the Samsung Galaxy S8, so we hope Samsung changes things up for the S10. Here’s what we want to see. The Samsung Galaxy S9 looks almost identical to the Galaxy S8, so it’s high time we got a new design from the South Korean company. Whether that means a notch, a new material or even a foldable phone we’ll leave to Samsung, but we want to see something new. While the Samsung Galaxy S9 Plus has a dual-lens camera, the standard Galaxy S9 only has a single-lens one. For the Galaxy S10 we want both models to have two lenses, or better yet, three. After all, the Huawei P20 Pro has landed with exactly that to stunning effect. 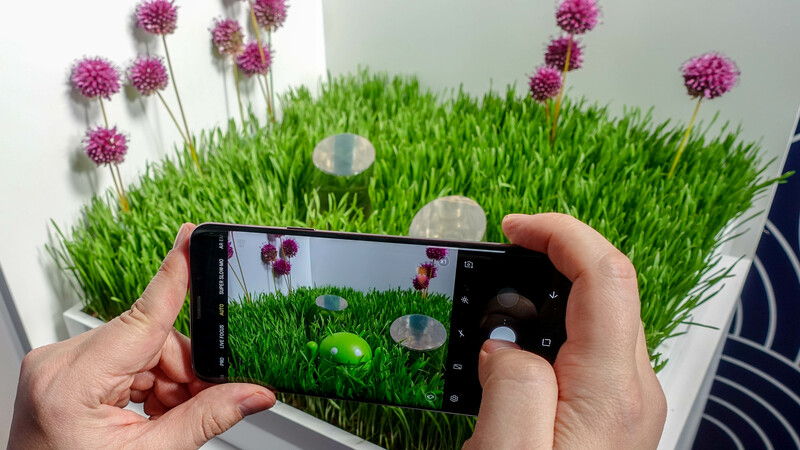 Samsung’s been delivering top smartphone cameras for a while now, but this year it has some real competition from Huawei, so for the Galaxy S10 we want to see it take steps to get ahead. The good news is that a triple-lens camera has already been rumored, though it sounds like only the priciest model will get it. 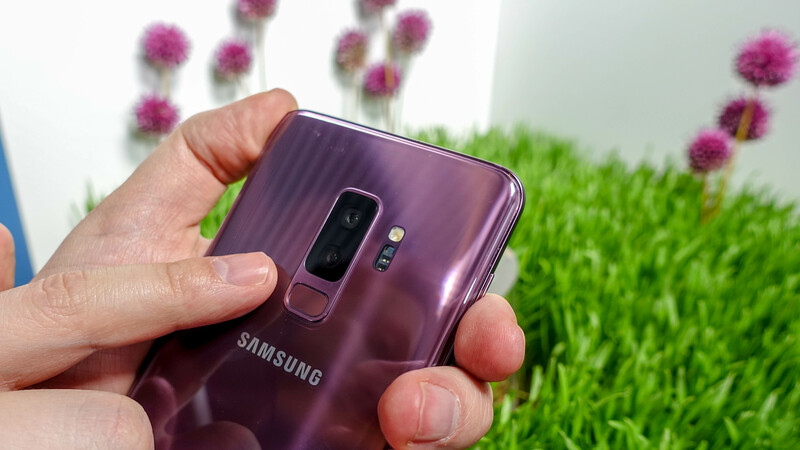 In-screen fingerprint scanners have been rumored for various Samsung phones and the Galaxy S10 is no exception, but now that other companies have launched commercially available handsets with them we might finally see Samsung roll one out. Having a scanner in the screen means it doesn’t need to take up space on the front or be awkwardly placed on the back, plus it looks high-tech enough to make owners of other phones jealous. This too has been rumored for the Galaxy S10, so there&apos;s a very real chance it will happen. While the overall quality of photos taken by the Samsung Galaxy S9 is very high, some lack vibrancy and a few are also more washed out than we’d have expected or liked. This is especially true when there’s background light, so we’d like the Samsung Galaxy S10 to be able to cope with this better. AR Emoji were one of the more hyped features of the Galaxy S9 range, but they were also one of the least impressive aspects of these phones. There are a few reasons for this. 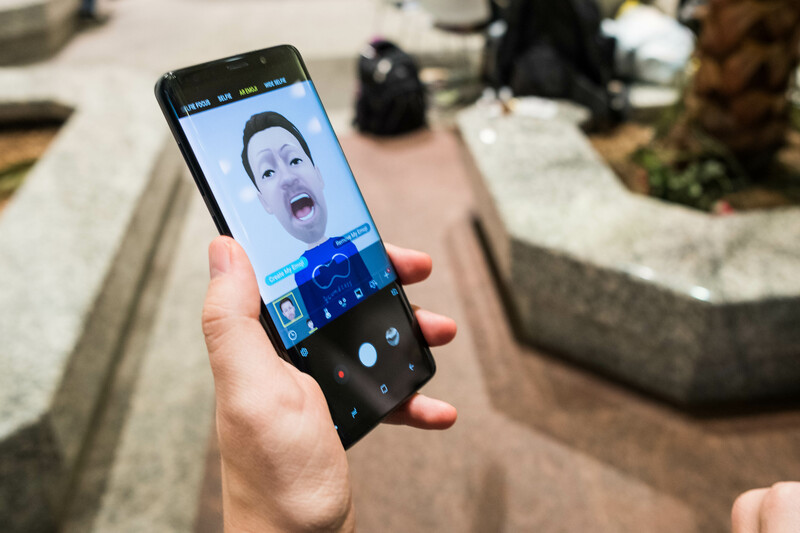 Beyond their inherently gimmicky nature it can also be hard to create one that looks like you, and when recording a video of yourself using the emoji, the camera’s facial recognition isn’t powerful enough to do it justice. While AR Emoji will probably never be an essential feature, if Samsung’s going to keep using them we’d like to see them at least rival Apple’s Animoji next time around. Battery life is one thing that doesn’t improve with each new phone generation. In fact, sometimes it gets worse. In the case of the Samsung Galaxy S9 and Samsung Galaxy S9 Plus you’re only really looking at a day of life. And while that might generally be okay for anyone who doesn’t mind plugging their phone in every night, it’s worth remembering that the battery will start to wear out over time, so a day of life when you buy the phone means less than a day a year or two on. As such we really want to see improvements to the battery in the Galaxy S10, whether that’s through a larger unit than the frankly small 3,000mAh one in the Galaxy S9, or just through more efficient hardware and software. We’ve said already that we want a new design from the Galaxy S10, but what we’d really like is a complete absence of bezels. As in no notch either, just an all-screen front. We’re not expecting this, not least because it would presumably mean building the camera and sensors into the screen, but it’s possible and would surely be less ambitious than a foldable phone, which we might also get from Samsung in 2019.